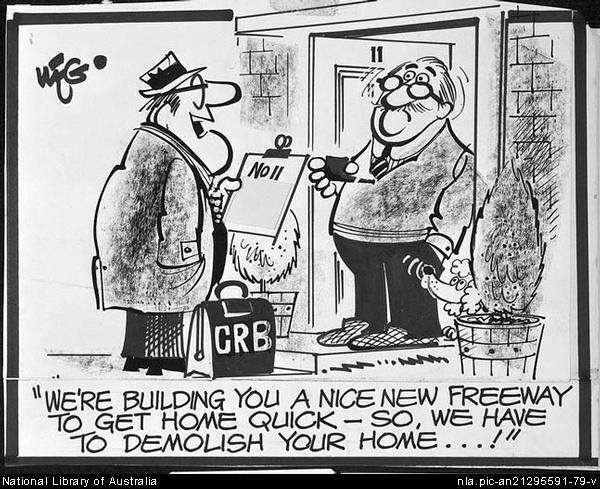 Image: Classic WEG cartoon from 1970s about home acquisitions for freeways. Source: National Archives of Australia. Update 6th December: If you want to pick up materials for a stall, visit the picket caravan in Westgarth St, near Brunswick street. Update 2nd December: If anyone is considering a stall but has concerns about resources, Adam Bandt’s office has offered to assist groups with photocopying and loans of basic stationery supplies if needed (clipboards etc). Please contact Georgia if this would help. This is a suggestion to hold a stall in your village. Saturday next (7th December 2013) is the last before East West Link Comprehensive Impact Statement (CIS) submissions close. Even if the panel process is a sham it is still critical that as many submissions as possible are made to help the panel and politicians gauge community anxiety. Big numbers make a big headline and may help the panel with their the assessment. Set up a stall in you local neighbourhood village – shopping centre or gathering place. The main purpose is to help people write a submission on the spot. Conversations about the project are also important. Writing Table(s) – the bigger the better. Chairs for submitters – the more the merrier. A copy of the CIS summary if you have one. A permit may be required. Ask your councillors to expedite it. Without one, there’s a risk the by-laws officer will move you. Print many copies of the cover sheet. Estimate the quantity. Can you easily print more on the day? Print many copies of a template submission. Use the template from Adam Bandt’s office. Or have one more focused on your local impacts. Or have both. Print a submission form, with headings relating to the terms of reference and blank lines for people to fill. If you need help printing, there are organisations that may help – ask your councillors, local member etc. Enlist volunteers for the morning around the peak periods. Who is doing the set-up and pack up shifts? Who is good at engaging with passers by stop and take a look? Aim to set up before the main peak to get everything ready. Give people the options and let them decide. Individual submissions are better than duplicates, but duplicates are much better than nothing. Some will just want to take a form and envelope and do it later. So let them. Collect donations for stamps or for your campaign. This is just a guide for ideas so feel free to improvise. The Collingwood Historical Society in Clifton Hill are having a stall next Saturday morning in Queens Parade shopping village. If you don’t have a local stall, drop by an make a submission there. If you want to pick up materials for a stall, visit the picket caravan in Westgarth St near Brunswick street.